Sprained ankles are the number 1 most common injury in basketball. That is equally the case for professional and amateur players. And for men and women alike. The most devastating thing about ankle injuries is that you’ll never really know how long you could be out of action. It’s an injury that even Kobe Bryant wasn’t immune to when it happened to him in 2013. At the time the official statement was an indefinite side-lining. When a doctor tells you that it is devastating. No matter whether you play as a professional or just for fun. The good news is though that you can buy footwear that will help you support your ankles in a way that reduces the chance of such injuries. You might think that because most basketball sneakers cover the ankles that they will have plenty of support. But reality is that kids and adults often get fooled by fancy marketing and the latest designs. I have seen it too many times while coaching high school kids. That’s why we’ve put together this list of best basketball shoes for ankle support. If you can prevent such injuries in the first place, then you’ll save yourself a lot of pain and downtime. So, let’s dive right into the top choices. The analysis of all these products is based on researching hundreds of options on the market right now. Just because a shoe isn’t on this list, doesn’t mean it’s bad. 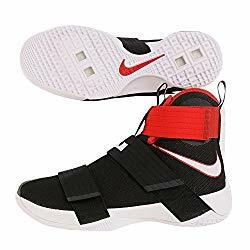 But we think that these ones have some superior qualities that make them the best basketball sneakers with ankle support that we can recommend. There is no limit to variety when it comes to these Nike Hyperdunks. From blue to green, red, yellow, and combination patterns, there is a plethora of colors for you to choose from. The Hyperdunk has responsive cushioning in both the heel and forefoot, helping to provide comfort in this dependable shoe. With a high-top design, these shoes provide your ankles with the support needed without sacrificing flexibility. You’ll be able to move around freely yet know that your ankles are taken care of. The ankle area may feel snug for those who aren’t used to these shoes, but the support they provide is on-point. With a unique Hyperfuse construction, these shoes are lightweight and breathable. Whether you use them in the summer or winter, they won’t be too uncomfortable to wear, even with the high-top design. Their trendy design is attractive for those who are all about style on the court. If you’re looking for a durable pair of shoes that offer both style and comfort, these may be the ones for you. These shoes made from textile and synthetic are both durable and breathable. With a high-top shaft measurement, they offer great support around the ankles. With responsive cushioning, it’s easy to stay comfortable while jumping and transitioning in a game. The unique lacing system on these Adidas Crazy Explosive, helps to take off pressure, for a more comfortable fit. They also have a trendy design that will look good on the court. If you want to own a few in different colors, you’re in luck. The Crazy Explosive design is available in a number of colors. As sturdy as these shoes are, they are also lightweight enough to provide you with the freedom and flexibility you need. While the laces do tend to wear out over time, loosening the fit, they also help the shoes to not fit so tight. They aren’t the best ankle support basketball shoes, but they do provide comfort and are highly responsive. The soles are made from polymer plastic, which helps to prevent slippage on wooden floors. While they aren’t as durable as rubber outsoles, they do a great job at providing top traction. These high top basketball shoes ankle support is something to be desired. They don’t have the best ankle lock-in, but they do offer top flexibility and support otherwise. Their trendy, attractive design doesn’t hurt either. Black, red, and white perfectly combined to make this stunning shoe stand out. If looks were everything, these shoes would be the winner, hands down. More than just the great style, these NIKE Lebron shoes are also highly comfortable with cushion in both the heel and forefoot. While the cushion may weigh them down a bit, they are quite responsive and are comfortable for explosive players. The rubber compound on the soles allows for good traction and is durable to be used on outside courts. Good grip is key for your safety while playing basketball, so you’ll appreciate the great outsoles on these shoes. These Lebron Soldier’s upper is made from mesh foam which allows for breathability. If you are looking for a comfortable and sturdy pair of shoes, these beauties are ideal. As you’re looking for basketball shoes with ankle support, consider the Reebok Shaq Attaq shoes. They are made from synthetic and imported materials and have a rubber sole, making them a highly durable shoe. The removable insole helps to make them comfortable for anyone who wears them. They have a leather and mesh upper which not only aids stability, but also helps them to be more breathable. These materials are also another reason why this pair of shoes is a durable option. The EVA midsole also aids in comfort, while the graphite helps to ensure support. Available in a few different colors, you can choose your favorite one in this stylish shoe. You can even pump these up for added support. If you’re a guy who wants a comfortable dependable shoe, these men’s shoes are top. Just be aware that if you have wider feet or need more toe room, these shoes may be a bit too snug for you. These beauties are all about support. With an external PU shell, you can rest assured that you’ll have the stability and support you need for your game. The external shank and heel counter also ensure that everything from the arch to the heel and forefoot is locked in. This unique design also helps to ensure that your foot doesn’t slide easily for more stable wear. With a molded synthetic upper, these shoes provide a great fit for any user. This feature also aids in durability throughout many games. They have great traction and grip to prevent slipping during your game. They have a rather narrow construction, so if you have wide feet, you may need to look elsewhere. Some may consider them to be a snug fit, but it’s the same lock-in feel that provides top support. They are made to last and can be played in for hours without a problem. Unlike some basketball shoes, these ones are very easy to get on without having to unlace them all the way. If you want a pair of shoes that is both comfortable and lightweight, these NIKE Lebron XIII are a good option. The one-piece mesh upper provides a snug fit while remaining breathable and comfortable. If you need a bit of protection and support for your feet, you’ll appreciate the Hyperposite panels. The foam lined collar helps to add to protection for your ankles and the rubber outsole is great for traction. After all, basketball players have to make many foot transitions, so a good grip is key. With large Zoom Air units, you can expect these shoes to be much more comfortable than others. If you need a dependable shoe for great performance, these Lebron XIII may be exactly what you need. As supportive as they are, they are also quite flexible so that you can play freely. These may not be the best sneakers with ankle support, but they sure do look good. Of course, they do have some features that allow them to be used on the court as well. For example, the full grain leather ensures that they will stay durable throughout plenty of use. Their rubber sole allows for a good grip and durability. With a shaft measurement of high-top from arch, they offer ideal ankle protection. Unlike some high-top basketball shoes, these are very easy to slip on and off. If you’re concerned about support, they do have ideal protection, but they lack in the cushioning that some other options have. If you want something that you can play friendly games in, but also wear for casual use, these PUMA shoes are great. A plus is that they are more affordable than some other options. The dual hook-and-loop shaft straps allow you to adjust the tightness around your ankle for added support. These are a gorgeous pair of shoes that will definitely make you look like a professional. With a unique, trendy design, you can be sure that you will stand out during a game. Available in other colors, you can choose the one that best suits your tastes. Besides being a highly attractive shoe, they also have a unique micro thread technology. This allows them to dry faster when they get wet and also helps to keep you cool even while you sweat. The moisture transport system wicks sweat, so you don’t have to worry when playing in warm climates. If you’re someone who struggles with smelly feet, the anti-odor technology is highly attractive. With a 4-way stretch design, you can easily transition in a game. Made from textile and synthetic materials with a rubber sole, these Under Armour Drive 4 offer durability. If you want a highly stylish and comfortable pair of shoes for the game that don’t sacrifice good ankle support, these are ideal. Made from synthetic and imported materials, these Reeboks won’t wear out quickly. The rubber sole allows for grip on the court and will last through many a basketball game. With a removable ortholite sock liner, these shoes are more comfortable than many. The high-abrasion outsole is made from a rubber that helps you to have the stability you need for foot transitioning. It ensures that you can keep wearing these shoes for many games, without them wearing out quickly. The mid-cut design allows for flexibility but doesn’t sacrifice support. The mesh upper allows for breathability, so you can wear these shoes, no matter the weather. Because of the full fit, it’s easy to get hot while playing, so you’ll appreciate that these are fresh to play in. They aren’t the most lightweight pair of shoes and may feel too heavy for some. But, the durability and protection they provide does help to make them worth it. If you don’t mind shoes that are a bit heavier but that keep you safe, these are an ideal pair of shoes for basketball. These shoes offer durability with their synthetic materials and the rubber sole. Where they lack is in the complete ankle support. Still, their mid-top arch is enough to provide your ankle area with some type of protection. The AND1 have a reinforced heel so that your feet won’t hurt after long hours of playing. The toe area has a no-sew fusion that helps to keep the shoe durable throughout plenty of months of use. The laser-cut vents help to keep your shoes airy—even while you play a heated match. Available in different colors, you can pick the perfect pair to go with your basketball clothing. They also have cushioning, which greatly helps you to be able to stay on your feet for a long time. If you play competitively, you may want to consider a more protective design. But, if you like to play with friends at the local park’s court, these will work just fine for you. As you are considering basketball shoes with ankle support, you may love some of the above options. Some have great style while others promise a great lock-in for your ankles. As you decide on an option that is best for you, consider the following features to better understand your needs. Basketball requires you to move around a lot. It requires you to transition your feet from one second to the next. It also means that you’ll be jumping a lot, which means that your ankles could be easily injured. That’s why it’s important to look into basketball shoes with good ankle support. A shoe with a high-top measurement helps to provide your ankles with snug protection. While some mid-top shoes may be enough to provide ankle support, it’s best to look for high-top options. Keep in mind that even if the shoe has a high-top measurement, it may not always provide the best support, so you want to do your research. Of course, choosing the measurement also depends on what position you play. High-tops add extra weight while mid-tops are better for flexibility. The style of the shoe may affect your game, so choose according to your style and position in the game. With so much jumping and moving around, you want a pair of shoes that will provide you with the comfort needed. Landing on your feet without any padding while playing basketball can cause injury over time. You want to make sure that you find cushioning that helps to provide support and comfort without making the shoe too snug. Shoes that have cushioning in both the heel and forefoot are always a good idea. They can help to keep you safe from stress fractures or ligament tears. You want to avoid shoes that don’t have any padding. Just imagine landing from a jump and hurting your heel or arch, due to the impact. This is how stress fractures tend to happen. Some high-top designs have unique lace designs as well. Some are your typical laces while others are simply “pull tabs.” How to choose the right design is about knowing which type provides you with the best fit. Some people like laces that are easy to tie for the snuggest fit, while others prefer being able to quickly get the shoes on and off. Just keep in mind that ankle support is very important, and you want a shoe that can help you with that. You may want to consider shoes with laces and straps, so you can easily adjust the tightness if need be. Materials are very important in your basketball shoes. If they are made from cheap materials, you’ll find yourself having to invest in a brand-new pair much more quickly. Because basketball shoes are not the cheapest kind of shoes, you want durable materials. When looking for your shoes, try to invest in ones with rubber outsoles and a leather upper. These materials will stand up to the wear and tear from playing basketball. Of course, there are other materials such as mesh that add to breathability, so if you can find a shoe with the perfect combination, you’re in luck. While style certainly isn’t the most important factor, you do want to feel good in what you wear. Fortunately, a lot of different designs are available in various colors, which allows you the freedom to choose one you love. There are some great designs in the above options. Whether you love your Nike shoes or prefer Adidas, you have plenty to choose from. Wearing shoes that you are proud to wear makes a world of difference. Just make sure that the quality and function is just as great as its style. Remember that high-top designs don’t always have the best ankle protection, so make sure to do your research when shopping. As you search for ankle support basketball shoes, you may ask why you need to protect your ankles. Because of how basketball is played, and the many foot transitions required, your ankles are put in a sensitive spot. No one wants to be off the court for weeks on end, which is a big reason why you need to consider how to avoid accidents. The following injuries are some of the most common ones that happen in basketball games and why you need a good shoe. Sprains tend to happen in basketball when the player isn’t wearing proper shoes. They tend to happen with quick movements and missteps. This tends to happen when a player wears shoes with little to no ankle support. A sprained ankle is no fun. The ankle tends to swell up and often the individual will have a hard time walking on it. Typically, you can’t play while you recover from a sprained ankle. Whether it’s a small sprain that you barely notice or a painful one, give yourself time to get better. Another painful injury from not wearing sneakers with good ankle support is a ligament tear. A sprained ankle is often a result of a ligament tear. Sometimes a ligament tear can be extremely painful where you can’t even walk. At other times, it’s barely noticeable, but should be taken care of. The severity of the pain you’ll feel is largely due to how big the tear is and where it’s located. When you go in for a dunk and land incorrectly, it’s very easy to injure your ankles. Because landing from a jump causes an impact, your feet tend to receive the brunt of the fall. When you don’t wear the right shoes with good padding and soles, you could expose yourself to stress fractures. Stress fractures are one of the most common ankle injuries for basketball players. They are small cracks in the bones and do require treatment. Sometimes you’ll notice the pain if it’s a large fracture, but other times, it may not be that much. If you don’t take care of it, you will find that with time it worsens. The best basketball shoes for ankle support will help you avoid common ankle injuries. No one wants to sit out a season and wearing the right shoes can keep you safe. If you aren’t sure which shoe is best for you, it could take some trial and error. Always remember that you want good ankle support in any shoe. If the shoe looks amazing but lacks in ankle protection, keep shopping. Of course, there are other factors to consider, but make ankle support a priority. These basketball shoes offer almost everything you need in the way of features. From the measurements to the style and materials, each one offers quality and support. Take your time and consider which option will provide you with the comfortable and safe wear that you need. Which shoe do you prefer from the above list? There are several top options for you. Stay safe and enjoy the game!